Presenting symptoms included mood swings that quickly changed from normal temperament to that of anger followed by depression. These episodes occurred every 1-2 weeks lasting 1-2 days. Major mood swings occurred once every 4 weeks, lasting 2-3 days in which the patient coped by disassociating from everyone until it passed. He was unaware of any triggers. He did not sleep well, waking every 2 hours. The patient had been prescribed Effexor and Seroquel as well as counseling for his PTSD symptoms. Both were discontinued due to worsening of his symptoms. The only medication he was currently taking was Pantoloc for stomach pain. Orthopedic tests were unremarkable other than mild weakness bilaterally in the anterior deltoid and hip flexors and this was only noticeable with the head fully rotated to the right. Surface EMG readings along the entire spine were normal. Neurological tests revealed abnormal heart rate variability. Manual visual testing revealed normal smooth pursuit of both eyes but slower than normal saccadic movement both vertically and laterally. There was a very mild convergence insufficiency. Horizontal and vertical gaze stability was impaired. The patient was treated according to the Kale procedure protocol. Treatment consisted of a thermographic scan followed by an adjustment when the established thermographic pattern of imbalance was present. The patient was adjusted in the knee-chest posture on a solid head-piece table. The knee-chest posture consists of the patient kneeling on a small pad on the floor, knees perpendicular to the thighs and thighs parallel to the floor. The head and shoulders are placed on the front of the table. 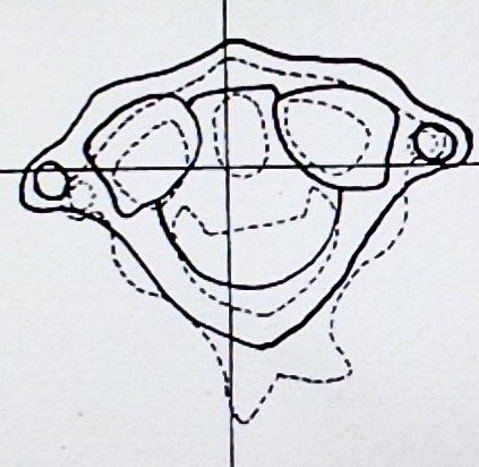 The head is rotated so the ear and mastoid process are flat on the table. In this case the patient’s head was rotated to the right placing the left ear and mastoid process on the table (Figure 2). The adjustment is a low force, body drop-toggle recoil. Altered venous drainage and lowered intracranial compliance was observed in a cohort of patients with mTBI. The mTBI cohort showed significantly higher venous outflow through these secondary venous pathways. In the upright posture, non-jugular valve-less venous pathways predominate the drainage of the skull. It is reasonable to think that such a cohort may have an increased sensitivity to further increases in intracranial pressure from a Valsalva maneuver. McCrory P, Meeuwisse WH, Aubry M et al. Consensus statement on concussion in sport: the 4th international conference on concussion in sport held in Zurich, November 2012. Signoretti S, Lazzarino G, Tavazzi B, Vagnozzi R.
Repetitive traumatic brain injury (concussion) increases severity of sleep disturbance among deployed military personnel. National Center for Veterans Studies, Salt Lake City, UT. Invisible Wounds of War: Psychological and Cognitive Injuries, Their Consequences, and Services to Assist Recovery. Board of Health of Select Populations; Institute of Medicine. Treatment for Posttraumatic Stress Disorder in Military and Veteran Populations: Final Assessment Committee on the Assessment of Ongoing Efforts in the Treatment of Posttraumatic Stress Disorder. Washington (DC): National Academics Press (US); 2014. O’Neil ME, Carlson K, Storzbach D, et al. Washington (DC): Department of Veterans Affairs (US), Jan 2013. Mild head trauma and chronic headaches in returning US soldiers. The Subluxation Specific The Adjustment Specific. Davenport IA: Palmer School of Chiropractic; 1934. 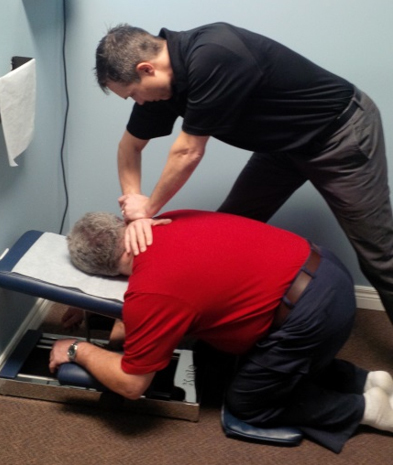 INSiGHT Subluxation StationTM, Discovery Model. Davenport IA: Palmer School of Chiropractic; 1950. Owens EF, Hart JF, Donofrio JJ, Haralambous J, Mierzejewski E.
Plaugher G, Lopes MA, Melch PE, Cremata EE. The inter and intraexaminer reliability of a paraspinal skin temperature differential instrument. J Manipulative Physiol Ther 1991;14(6):361-7. McCoy M, Campbell I, Stone P, Fedorchuk C, Wijayawardana S, Easley K.
Modern X-ray Practice and Chiropractic Spinography. 3rd ed. Davenport IA: Palmer School of Chiropractic; 1957. Leddy JJ, Sandhu H, Sodhi V, Baker JG, Willer B. Rehabilitation of concussion and post-concussion syndrome. Enix DE, Scali F, Pontell ME. Orthospinology Procedures: An Evidence Based Approach to Spinal Care. Philadelphia. Lippincott Williams & Wilkins, 2007. A unifying hypothesis for hydrocephalus, Chiari malformation, syringomyelia, anencephaly and spina bifida. The possible role of cranio-cervical trauma and abnormal CSF hydrodynamics in the genesis of multiple sclerosis. Physiol Chem Med NMR 2011;41:1-17. Djorde R, Nenad I, Jovo K, et al. Incidence and distribution of extravascular compression of extracranial venous pathway in patients with chronic cerebrospinal venous insufficiency and multiple sclerosis. Wostyn P, Audenaert K, De Deyn PP. The Valsalva maneuver and Alzheimer’s disease: is there a link? Pomschar A, Koerte I, Lee S et al. Kuriyama N, Tokuda T, Yamada K, et al. Flow velocity of the superior sagittal sinus is reduced in patients with idiopathic normal pressure hydrocephalus.